6 x Large Green Fritillaries, 20 Common Blue, 5 Small Heath, 2 x Meadow Brown. 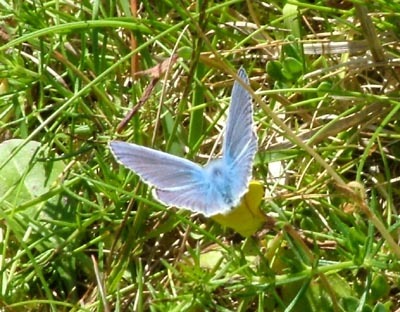 The Common Blue - Polyommatus icarus - was seen fairly frequently alongside the footpath. Perhaps 20 individuals. Two orchids from the wooded area. 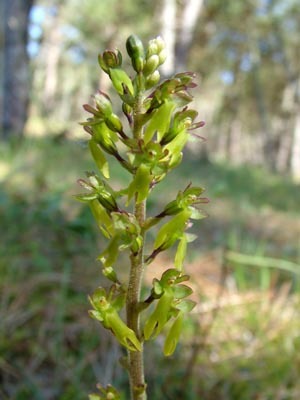 Common Spotted Orchid on the left and Common Twayblade on the right. This was growing from a cushion very close to the ground. Must be Knotted Pearlwort - Sagina nodosa, althogh it's very different from my local ones. Flower about 1 cm across. 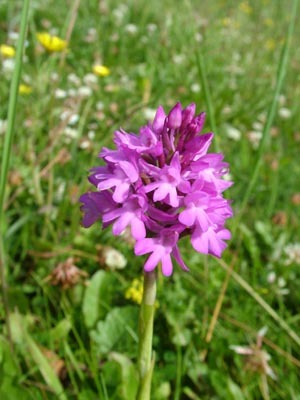 This is the Pyramidal Orchid - Anacamptis pyramidalis. Two more maritime plants - Wild Thyme - Thymus polytrichus - and Lady's Bedstraw - Galium verum.